¿Pero, Ramone, cómo puede usted?” asks Victoria with an exaggerated tone, a single tear rolling down her cheek, the long mascara streak making a mess, and her obviously blonde-tinted hair looking worried. “Porque tuve hambre,” Ramone responds with a tone more abrasive than necessary, his hair way too perfect with the exception of two well-placed strands that are stiff from mousse. There is the quick pan to Victoria’s face and then a brief pan of Ramone, whose face around his lips is smeared with gravy, more music and then the scene fades to black. This is quite typical of Argentinean novellas. The language is flowery. The women are too perky, regardless of their age, and the men overcompensate with the macho dizzy acts — regardless of their age as well. The storyline is usually great, but “¡Para el amor de Dios!” But despite the bad acting, there is one thing that Argentineans do well — food, food, and more food. By the time everyone came, we had a seat immediately waiting for us. I think it helped that I told the waiter that we were dining with an Argentinean actress. I didn’t give a name, which you’d think he would have been begging me to give, but he smiled a wide, thin smile and made sure that we had a table as soon as the party was there. Oh, wait. It may have been because of those characters outside taking photos of me just as I walked in. Oh. 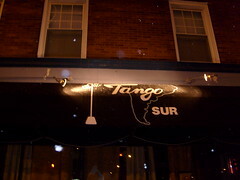 But to give you an idea of the atmosphere for Tango Sur, its intimate such that the seating is close, which is the case in restaurants in Argentina. There is, of course, the dim lighting to conserve energy — why else? — and the clamour of conversation all around. Many of the patrons come in as groups consisting of families, friends, and both. In the like vein of the other restaurants where we foodies have gone, it panders to a sense of community — loud and boisterous. Upon getting to our table, we were ready for action. Unlike my restaurant adventures of years long gone where my dining mates were ridiculously indecisive and embarrassing, we scanned the menu and made our choices within a few minutes. 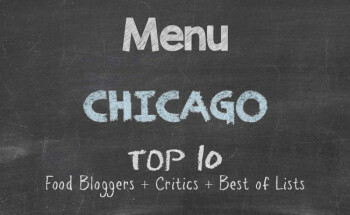 Don’t ask me how we did it with such quickness because the menu is overwhelming. But one great man once said that if you can’t make up your mind about what you want to eat, then you will have a hard time making up your mind about what you want in life. Oh, wait. That was a harsh statement I had once made to a bad date — left the poor woman bedazzled by my arrogance. Anyway… Having placed our orders and handed back the menus, we opened a bottle of Argentinean wine to toast our celebration of … eating at Tango Sur. Purchased from a high-end wine store from across the street named Que Syrah, this was our first bottle of red wine to go with dinner. We started with two filling appetizers. The first one was the antipasto. This was a platter of quesos argentinos, salami, jamon crudo, aceitunas y mortadella. 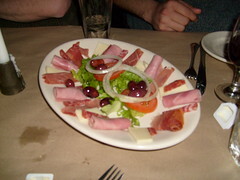 Translation Argentine white cheese, salami, prosciutto, olives and mortadella. This was a nice cold plate of delicious meats and cheeses that we figured would be light, considering we knew the main entrées would be heavy. 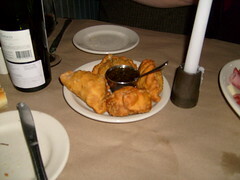 The second appetizer consisted of empanadas. These were turnovers con carne, pollo, jamon con queso y espinaca con queso argentina. Empanadas are a favourite in Latin American restaurants and one of the local haunts where I hang out in my neighbourhood gets a lot of my business, as I am constantly buying empanadas for breakfast and late night snacks. It’s getting to the point where the chefs in the kitchen hear the owner or the person at the cash register talking to me and they stick their heads out the kitchen to speak. Talk about love. And then came the entrées. Oh happy day! 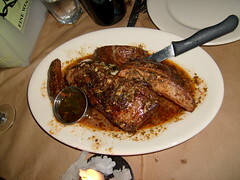 Because Tango Sur is really a steak house, we knew that the main entrées we were going to get would be all meat. So we figured we would balance that out with a little something else aside from the complementary salad — rabbit food — and bread that we got. We had ravioli — and, no, we’re not talking Chef Boy-R-Dee. I can hear some little old Italian woman wagging her finger angrily and saying, “No rigatoni for you,” at the mention of Chef Boy-R-Dee. We did a mix of ravioli, some stuffed with cheese, some stuffed with beef. 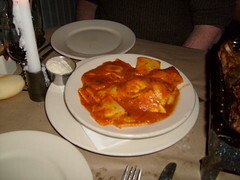 We were stuffed with ravioli. The sauce was better than anything you could have extracted from a can. Not a hint of salt, but far from bland, it was great on the tongues as we gobbled up the plate of goodies without complaint. One of the big entrées was called the Para Dos, which meant for two, but was more than enough for the four of us who were determined to let it be known that we love ourselves some good food. Piled up on a meat platter, the Para Dos consisted of asado, vacio, chorizo, molleja y morcilla con ensalada. Translation: grilled short ribs, flap meat, sausage, beef, sweetbread, and black sausage. Sigh! And to wash this all down, we opened a bottle of Italian red wine. I could hear the little old Italian woman wagging her finger and saying, “You have great taste in wine and that looks like a mighty fine meal you’re having there. You all wouldn’t mind if I join you?” Needless to say, this was the living and with my usual foodie friends in tow, we had our share of laughter, jokes about work, commentary about the Normal Rockwell 2009 effect with all the pretty-pretty muchachos and mujeres at the restaurant, and bellies that we knew would not growl for a couple of days. In addition to all of that, we had a Bife Vesuvio. What in the hell were we thinking? We’re talking a liberal plate of grilled prime steak sliced and filled with spinach, mar del plata cheese and garlic in a white wine sauce, accompanied with Argentine style potatoes. To round out another successful, jolly food outing, we had a round of desserts. 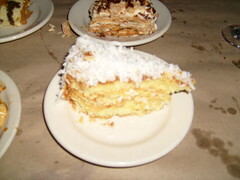 We had coconut cake that I must admit was very delicious. I am usually turned off by coconut cakes with coconut flakes swirled in white Betty Crocker, Duncan Hines, or Jiffy frosting. That’s wrong, wrong, all wrong. The icing should be fluffy, not sugary, and Tango Sur got it right. 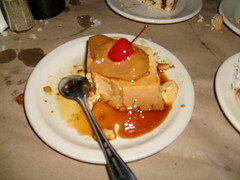 The flan hit the spot, as we figured it would. They served it up with a dollop of creamy caramel on the top — along with a cherry. 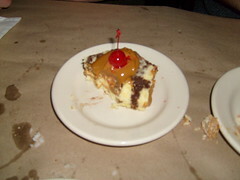 There was something about the consistency of the flan that indicated that it wasn’t a mass produced product that they merely cut, put on a plate, and brought out to us with a well placed smile. There was the ice cream pie with chocolate and a dollop of caramel — with a cherry on top — that I need to get the recipe for, which means I’m going to have to befriend someone in the kitchen. Being one who makes his own ice cream from scratch, I’m very particular about ice cream and although I am sure the ice cream may have come from a box, the whole dessert would be my one last wish if I had to choose between a bad date and watching any one of the Batman picture shows that had George Clooney in it. 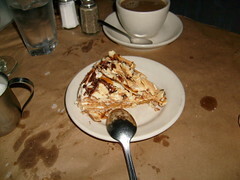 Our fourth dessert was a pastry that was mix between a Napoleon and a tiramasu. It was just heaven and believe me when I say that I bet our stomachs felt the same. So, would I got back? Well, that goes without saying. I have read reviews where people complained about something — probably just to give a negative review for good measure. The restaurant isn’t the full-room size of a restaurant you’ll find in Stepford World, so it fills up quickly and having to watch the food go out to the tables can be taunting. The one thing to note is that the portions of the food are overwhelming, so going in with the appetite of a bird or an indecisive individual can be counter-productive for the full experience. [I wonder what was on the guy’s mind at the table next to us who sat and watched his friends eat like oinkers while he had noting but wine. 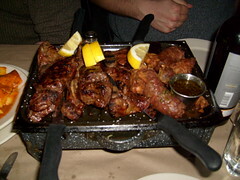 You don’t go to and Argentinean steak house to watch other people eat — unless you are the Hollywood type, I guess.] For us foodies who went, we expected a huge tab for the bill and for all that we ordered along with the two bottles wine that I had bought from Que Syrah, we still made out like happy bandits. And we’re planning to go back in the near future. Go with a group of friends who enjoy good food and good company. If you go on a date and eat the way that we foodies did, you’re going straight to bed thereafter — a nightcap what? As to my indecisive date I had mentioned earlier, I found out that she recently got divorced. She had married a man who loves to eat. Hell, Ray Charles could have seen that. Hint hint. Nothing like a little incompatibility to get perspective, I always say.